The sign outside the room where Holly Schmehl pumped breast milk. In a multifunction room in Spokane County's Broadway Center Building, Holly Schmehl sat with her top half almost completely exposed while she pumped breast milk to feed her newborn son. 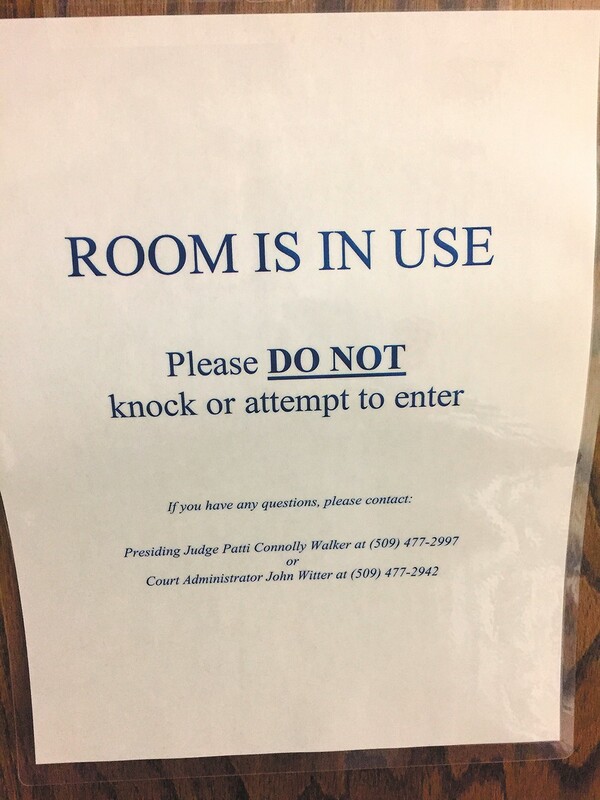 The door was locked and a laminated sign hung outside that read: "ROOM IS IN USE Please DO NOT knock or attempt to enter." But shortly after Schmehl started pumping that day in September 2016, someone rattled the door in an attempt to get inside. Startled, Schmehl cleaned up and left in the middle of her pumping session. This wasn't the first time since she'd returned from maternity leave three months prior that someone had walked in on her (or tried to). It was, however, the final straw. "I realized I couldn't continue working there, and nothing was going to change if I did," Schmehl says. Three days later, she resigned from her position as an accounting technician for Spokane County District Court Judge Richard Leland. In February 2017, Schmehl filed a legal claim (a precursor to a lawsuit), naming Leland and other county employees. In it, she says she was not provided adequate space to pump, was constantly interrupted and felt pressured to quit. As a result of the sporadic schedule and anxiety, she noticed that the amount of breast milk she would express during each session decreased by about half. "It became a power struggle," Schmehl says. "I would skip sessions, delay, find excuses and avoid people so they would leave me alone. And I would think, 'It's me, I'm asking too much.'" Schemehl's attorney, Jeffry Finer, says they are still weighing whether or not to officially file a lawsuit. He says he's filed a public records request for more information, but in the meantime he points to the federal law that requires certain employers to provide accommodations for nursing mothers. Specifically, those accommodations must be shielded from view, free from intrusion and cannot be a bathroom. "The federal law is intended to [remove] an employment barrier to the physical barriers" of nursing a child while at work, Finer says. Schmehl's claim lays out several emails among District Court staff alerting them to the time and place reserved for her to pump. Often, the room's furniture would be rearranged, blocking access to the outlet she needed for her pump or others would be using the room during her scheduled sessions. In an interview with the Inlander, Schmehl also describes hearing second hand about Leland's displeasure with her pumping accommodations interrupting the court's business. Leland declined to comment for this article, citing the potential lawsuit. As the issues persisted, Schmehl also describes feeling embarrassed and uncomfortable. She says she spoke to the county's Human Resources Department, but nothing changed. "What's more upsetting is the more people I talked to who've had children while working there, no one has really been accommodated," she says. "I experienced a lot of physical discomfort: breasts swelling and leaking. It was probably the worst things I ever experienced publicly. I was lucky because I didn't have a lot of the medical issues that a lot of women have." She's referring to an infection known as mastitis, which can be caused by clogged milk ducts and can occur if a woman doesn't breastfeed or pump regularly. Steve Bartel, the director of the Spokane County Risk Management Department, says the county's investigation is currently on hold until Finer's public records request is filled. However, Bartel says, the county's preliminary investigation indicates that Schmehl's claims are exaggerated. "Right now it doesn't appear we're in that category to reach a settlement they would accept," Bartel says. "I believe there were some things, miscommunications, and some unfavorable occurrences, but I don't believe any of that rose to the level of liability against the county." Since Schmehl resigned, Spokane County has finished outfitting two locations designated specifically for nursing or pumping — including a "Mamava Pod," similar to those in airports and shopping malls, Spokane County spokesman Jared Webley says. Last year, the city of Spokane designated a "Mothers' Room" on the fourth floor of City Hall. The original print version of this article was headlined "'A Power Struggle'"